Don’t keep looking over your shoulder to see where Summer went! Fall is here and if you don’t pay attention to it, you are likely to run smack dab into that snow bank called Winter, wondering what happened to Fall. Fall needs to be paid attention to. It's a season that reveals the character and form of a garden, as leaves fall from the trees and once flowering perennials transform themselves into brown stalks of “winter interest”. It’s the season that pulls back that curtain of greenery we’ve become accustomed to and shows us what is really going on in the garden. And a lot has been going on in my garden. I noticed that enough leaves have fallen from the crabapple tree by the front walk to reveal a big “stinging insect” nest. I stood there and studied it for a few minutes to see if it was an active nest and noticed a few insects flying around it. I would guess that it's a bald-faced hornet’s nest. Bald-faced hornets are actually “social wasps” like yellow jackets and paper wasps, but they are only social amongst themselves and don’t appreciate intruders like me getting too close. The good news is that I wasn’t stung by any of these hornets, or at least haven’t been stung so far. 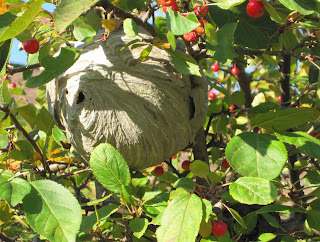 In the past when I’ve been stung by paper wasps and yellow jackets it was when I was trying to get rid of them, so perhaps my good luck was in not finding this nest until the end of the season. Now I’m not even tempted to try any heroic efforts to get rid of the nest, knowing that the frost will likely finish off the hornets in a few weeks. And while I wait for the first frost, I’ll be out in the garden, looking for more character and form and signs of what really went on here this summer. But I won’t just be standing around looking at hornet’s nests! There's too much to do for that kind of leisure activity, though you want to take a little time for it. Instead, I’ll be busy bringing in a few plants (this weekend), cutting back some perennials, because they aren’t as interesting in winter as some would want you to believe, but leaving other perennials standing because they provide food for the birds. I’ll also be putting away garden furniture, stowing hoses, planting bulbs, pulling weeds – always the weeds – and hopefully mowing the lawn a few more times. This fall clean up in the garden is a routine I know well enough that I could do it with my eyes closed. But while I'm working in the garden, I’ll keep one eye open for more discoveries, like the hornet’s nest. And always I’ll be dreaming of the coming spring, of May, when the grass is green, the skies are blue, and the garden is all new again here in my garden, May Dreams Gardens. I also found out today that I won 2009 Blotanical awards for Best Writing and Most Educational Garden Blog. Thank you to all who voted for me, and especially thank you to all who visit my blog and leave some of the nicest comments. Those comments are little rewards each and every day. Thank you! Congrats on your award. A very deserved win. Keep up the good work! Congrats on your Bloggie wins too. Well done and richly deserved! The work Midwest and Eastern gardeners do to prepare for winter never ceases to impress me. I'm not sure I could manage it! Congratulations on your awards...well deserved and also impressive! Congratulation Carol, it is a small thank you for the joy you bring me. I love your blog and though I don't often leave comments I read every single post, every word. I look forward to all your inspirational posts to come. Isn't it amazing that those hornets can build something so large right in the garden and you don't see it until it is revealed by falling leaves?? I think this is a beautiful work of art. Congrats on your well deserved award. Somehow fall cleanup is not a routine I could do with my eyes closed. I always need to go outside with a clipboard, looking around and writing things down. My big thing to forget is to take the rain gauge in before water freezes in there and breaks it. Congratulations, Carol – on your unstung status (this time, anyway) and on your accolades at Blotanical. You deserve none of the stings and all of the flowers. FYI: For future reference. The City of Indianapolis will remove a hornets nest from your front yard free of charge because it is a danger to the public. So no worries about being stung. They wear protective gear. We had one removed a couple of years ago from our big Maple. Congratulations on winning a very well deserved award! Carol, congratulations on your award! Many years of happy gardening and blogging! Carol, I don't do much fall clean-up preferring to leave the seed heads for future generations etc...but I do have to do a lot of leaf mulching and assessing. Lucky you to have hornet removal available. Who knows what services are actually available in our cities! Congratulations on your awards! There's a lesson there about learning to live together and trying to get along. That's it, Embrace the Presence of Hornets, or something. Once again, congratulations. Visiting your blog is always a delight & a treat, even if I don't quite share your enthusiasm for veggie gardening. You sound so calm about the fact that they are right outside the front door. I would be happy to pass on socializing with those hornets. Congratulations on your Blotanical awards, Carol! I was so glad to see your awards. congratulations. 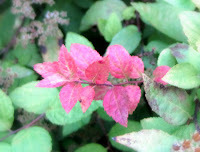 Yes, even here, where we have a seemingly endless fall I've noticed the changes. It's an unending string of surprises. Hurrah for the garden. Congratulations on your awards, Carol! You continue to educate me as well as entertain me with every post, so these two are particularly appropriate for your excellent posts. OK, that wasp nest looked HUGE! Be careful! Congrats Carol!!! Well deserved. H.
Congratulations on your Blotanical awards Carol - no surprise to me! I SHOULD be getting stuff ready to bring in, but I can't get to the gardens as we are living in a construction/earthquake zone with the patio and walks in process of being replaced. I'm all discombobulated since I can't get to the tender stuff to start getting it inside. The basement is ready and waiting though . . . Good thing we've had rain to wash all the brick and concrete dust off everything and keep it watered - can't do that either with the hoses disconnected. . . sigh. . .
Congratulations on your Blotanical award, Carol. Carol, a hearty congratulations for your Blotanical wins! You're very deserving and though I don't get over here nearly as often as I'd like (I can't keep up with your proliferous pen! ), I always enjoy it when I do. Good job! Keep it up! congratulations on your award. I feel like you were reading my to do list from today. I was just thinking how it feels like I just brought out the summer stuff and did the pre summer chores and here it is already time to ready for winter. Time flies that's for sure. We had our first frost this morning, but I didn't have time to take photos of it. It got down to 29 wherever they record the temps from, but I don't think it got that cold here. I do need to accept that fact that summer is over, though. I really came here to congratulate you for your blotanical awards. You are gifted in the area of words as well as plants. Thanks for continuing to sponsor GBBDs, too.